Fresh Fig season is almost over, and I’m sad. 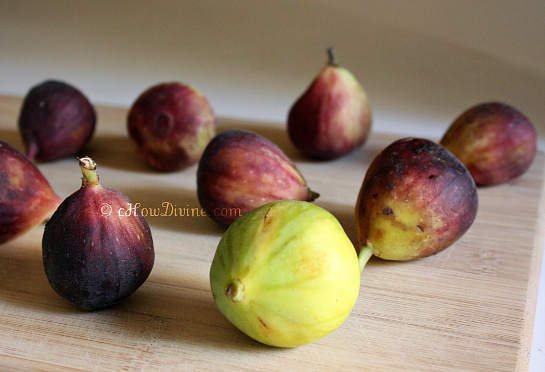 I love raw fresh figs. You can simply twist off the stem and pop them in your mouth. They are sweet in taste: a subtle combination of berries and/or peaches. The flesh and the skin of the fruit are soft and chewy; and the small seeds provide plenty of crunchiness. But there are so many other ways to enjoy raw fresh figs: dipped in chocolate or other creamy sauces, stuffed with cheese or nuts, drizzled with honey, etc. And I’m going to eat as much fresh figs as I can, in as many ways as I can, while I can. 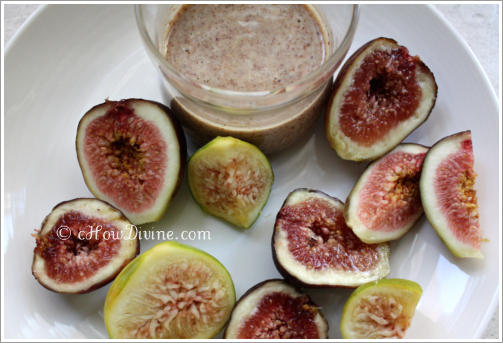 Because not only are figs delicious, they are packed with nutrients. Figs are a fruit source of calcium; they are also a good source of dietary fiber, potassium and manganese – some of the minerals our bodies need for healthy functioning. 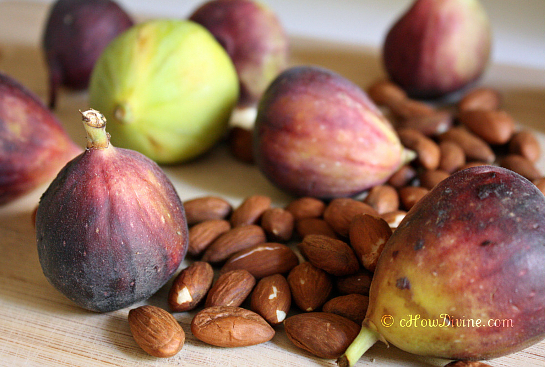 With all of their health benefits and their tastiness, I was shocked to discover that many people have never tried fresh figs – including my husband. In fact, my husband hadn’t had any type of figs prior to this summer – dried or fresh; well, let me qualify that by saying, other than in Fig Newtons. After hearing that, I had to run out and grab some fresh figs, just so he can try them. Needless to say, after trying fresh figs, he’s hooked! If you haven’t yet tried fresh figs, you really should. Run out and get them before the season is over! Note: Pick figs that are soft but not mushy. 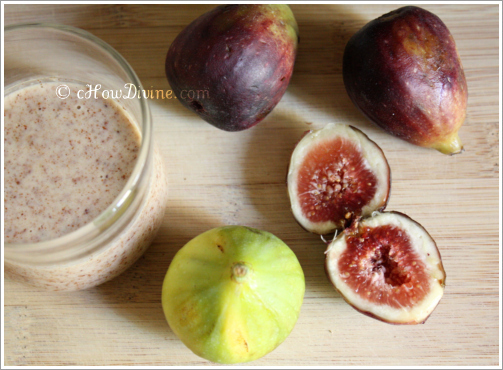 Figs are very delicate; once ripened, they will only be good for a few days. Buy only as much as you can consume. Combine all ingredients from raw almond butter to cinnamon in a small bowl. Mix well. Serve with quartered fresh figs. 12 fresh figs, quartered with bottom still attached. Gently wash fresh figs and dry. Twist off or cut off the stems. Cut the figs from top as if you are cutting them in quarters but leave the bottom 1/3; uncut. 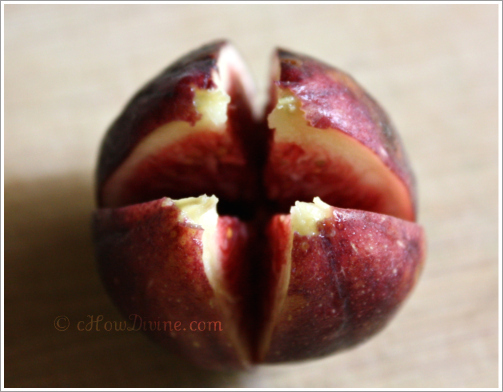 Gently open the figs; you can do this either by opening from the top or by gently squeezing the bottom 1/3 of the fig that has not been cut from all four sides. Drop 1 tsp of goat cheese in the center. And stuff a walnut half in the center. Enjoy with your favorite glass of white wine or all by themselves as an appetizer, snack, or dessert!